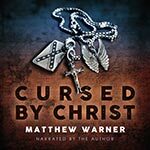 The period for free listening of Cursed by Christ will end July 2nd. So check out the book information page to follow the links to YouTube, and hear what you’ve been missing. After that, the only way you’ll find it is through the various retailers or your public library. Based on reader reactions, I feel I should point out something I’d assumed would be obvious. Cursed by Christ is a Southern Gothic horror novel set during the Civil War. Its title concerns the main character’s belief she is being punished. Whether she actually is or not is up to you, the reader, to figure out. Some have wrongly assumed, without reading it, that this book is a commentary on their religion. Nothing could be further from the truth. If you’re really interested in my views on Christianity, then the next (as yet unannounced) novel coming out this year should be more thought provoking. If anything, Cursed by Christ is more an evaluation of the dehumanizing effects of racism, but whether it succeeds there is again up to you to decide.